When the leaves change in New England they do so in a southern-moving pattern. Where I grew up in northern Vermont, the colors were explosive in September, branches were bare by October. Here in new York it is a slower, more drawn out process, and I admit I have been losing patience and wanting an excuse to head north and meet fall head on. 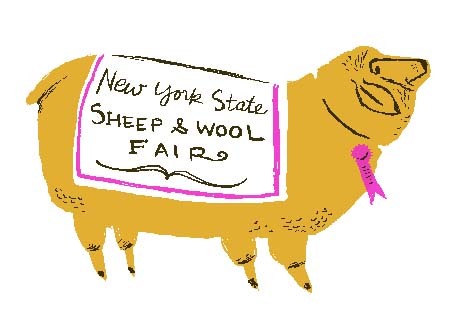 Luckily, the annual New York State Sheep and Wool Festival, held annually in Rhinebeck, New York, was this past weekend, and Jennifer and I were both able to get away. The best part? We would take the train. And not one of the modern commuting trains that serve New York City and its bedroom communities, but Amtrak. What Amtrak leaves to be desired in the form of punctuality and convenience, it more than makes up for in nostalgia, with it's retro-adorable uniformed stewards with their stepping stools who offer a hand to every passenger climbing on and off, and of course the cafe and sleeper cars. The route from New York City to Rhinebeck, in a car or by train, winds along the Hudson River. Its the same route my grandmother and great grandmother took, via Amtrak, to their college in Poughkeepsie, and I always imagine them when I am on this route, each in the era in which they were college-aged, going to and from New York for shopping and parties and boys. I suppose the trains themselves have been replaced and revamped, but the view from their window was exactly the same as the view from mine. We left a bustling Grand Central Station at 11:45 and in just a few short hours later were making our way into the Fair, bumping into my good friend and editor Melanie Falick, who was waiting in line for fried artichokes. It was an especially funny moment, because Jennifer and I were both wearing the Meathead hat from the book Knitalong. Knitalong is a wonderful book full of great patterns written by Larissa Brown and John Martin Brown, edited by Melanie. Jennifer had knit one for me in green, obviously aware of my lack of knitting skills, not wanting me to be the only person at the fair not wearing something hand-knit. The fair takes place (always during the perfectly chilly but beautiful third weekend in October) on some lovely old fairgrounds, permanent barns bearing the 4-H clover divided into stalls housing sheep, goats, llamas, and even a few bunnies. Surrounding tents house sellers of yarn and books, brooms and cheeses, sheepskins and sweaters. I wasn't shopping for yarn. I have more yarn than my own skills as a knitter could possibly require, and my latest project was sitting under my sofa (is still, actually) having been stalled due to my cat eating the tips of my circular bamboo needles. I was looking instead for a sheepskin that could be used for a bed for Lobo and Benito, hoping that they might like to spend the winter on a fluffy sheepy bed in front of the fireplace, and maybe give me my spot on the sofa back. We wound around through barns and tents filled with bags and bags of wool, roving, yarn, and livestock. Jennifer found the most amazing yarn, and I found the perfect sheepskin. Only thirty dollars, it is a bright acid yellow. There was also a bright, hot pink, and an orange. "I don't know why HE decided to dye these" said the woman loudly as I handed her my money, loudly enough for the man behind her to hear, and I realized that her husbands unsuccessful experiment had become my find of the day. A quick look around confirmed that the other, natural colored skins in the booth were priced closer to $300. Very exciting. Next we stumbled onto a judging of goats, lined up with their owners waiting to hear if they would be going home with a ribbon. Apparently manners are not a part of the competition, because first place went to the one who seemed intent on drowning out the announcements with a persistent bleating that seemed to grow louder when the length of his hind legs were criticized. He reminded me a little of Kenley from Project Runway. By late afternoon we were starving, and headed for a long promising line that wound around a large tent with a hand painted sign proclaiming "POTPIE". We waited in line for what seemed like forever, watching everyone around us eat steaming chicken and vegetables from a little pie tin covered in thick crumbly crust, only to be told that they were sold out. It was a minor tragedy, but one that cemented our decision to return next year. We settled for hand rolled pretzels, artichokes and escarole, and later some apple pie and ice cream, which we ate while watching the last few moments of the sheep dog trials and demonstration of dog tricks, our hearts completely stolen by an australian shepherd, his frisbee, and his owner. 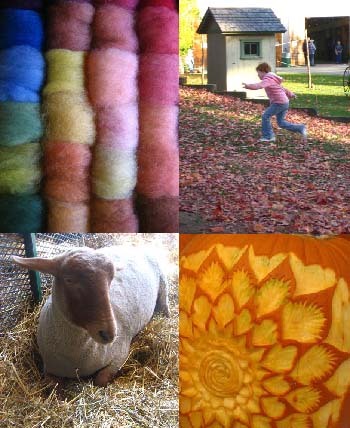 Anyone who loves knitting or wooly animals or being outside on a crisp fall day with leaves blowing around and deadly amounts of fried dough should put this event on their list for next fall. Drag your husbands and kids, the animals and pot pies will keep them occupied. If you are able, take Amtrak. Jennifer knew of some lovely little rentals in the area for weekend stays, but we agreed that it made a better one-day trip. 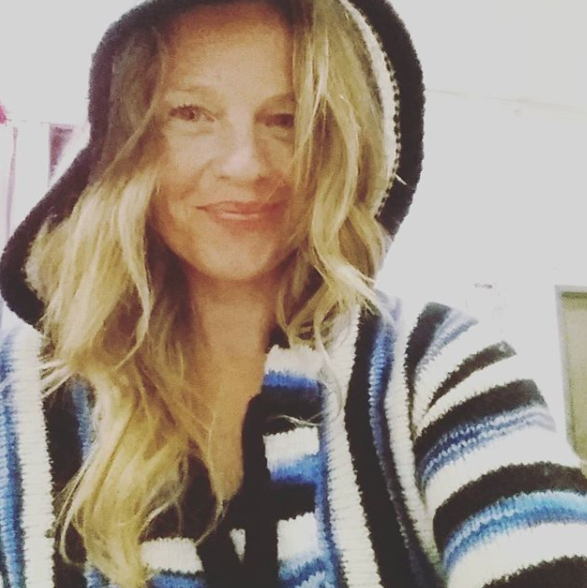 When we were boarding our train back to New York, I watched as the sleeper car slowly rolled by, carrying travelers from Chicago and points beyond tucked into their sleeping berths, some of them reading, one of them knitting, and imagined taking my own long winding by-rail tour of New England, tucked snugly in my own sleeper car with someone I love in some future October.